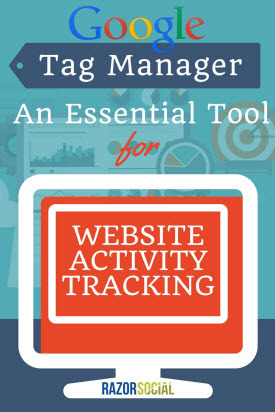 What is Google Tag Manager? You’ll often need to collect information or track activity on your website. For example, you might want to use Google Analytics to track details of visitors to your website or track visitors so you can target them with Facebook ads. The normal procedure for this is to get a piece of tracking code and copy it to every page of your website that you want to track.This starts to get messy as you add more and more code to your website and there are also some potential issues (e.g. it takes time for your website to load these tracking codes). Google Tag Manager simplifies this (plus there’s lots more functionality too!). With GTM, you just need to add the code onto your website and then on you go, to Google Tag Manager itself, to add any further tracking code/scripts.